Mobile Friendliness, Performance, Best Practices / PWA and Usability guidelines documentation. Websites aimed at generating a 'lead': getting users to sign-up, register for a newsletter, express their interest regarding the service or the product that the company is ultimately selling. Websites displaying articles, news, infographics, or research results on a certain topic. Websites designed specifically to showcase a product, campaign, or event..
Websites showcasing an experimental, artistic, gaming or immersive interactive experience. Websites which main goal is to a specific event or a series of events: conference, festival, etc. The event has a specific dates, agenda, line up. Websites that serve as an aggregating platform for products and services in a specific category (excluding Retail, Travel - see relevant types). External users can submit their offering to the platform. The items to be checked and the sources to retrieve metrics/results are established by Google and Awwwards. Since most of these sources are periodically updated, over time scores can change for a certain website for the same items/categories. Three pages will be evaluated, except for one-pager websites: the homepage or landing page, plus 2 others chosen manually (typically an About page, a Product overview page or Product detail page -- if not present, then Contact page). Each category will receive a score of 0 to 100 per page, based on the number of its internal items (total item results sum, divided by the total number of items). The score of a page will be determined by the sum of the checklisted scores, divided by the total number of checklisted items. In the same way, the final score of a website will be determined by the sum of all the evaluated pages average, divided by the total number of pages being evaluated (3 pages will be evaluated, except for one-pager websites). Sites that reach or exceed a global score of 70/100 will obtain the Google Mobile Excellence Award. If a site does not reach ≥70/100 on the Homepage test, the evaluation process will end and the report will be sent detailing only the results of that page. Regardless of whether a website obtains the Mobile Excellence Award or not, all the information and metrics gathered will be sent to the user in the report. As the aim of the Mobile Excellence Report is to improve mobile experiences across the board, users are permitted to make changes after receiving their report and request to have the report done again in order to get a new score that reflects the improvements that have been made. To become Mobile Site of the Week the site must be one of the highest voted in the last 3 months and also have won an Honorable Mention. It is then highlighted on the Awwwards homepage. 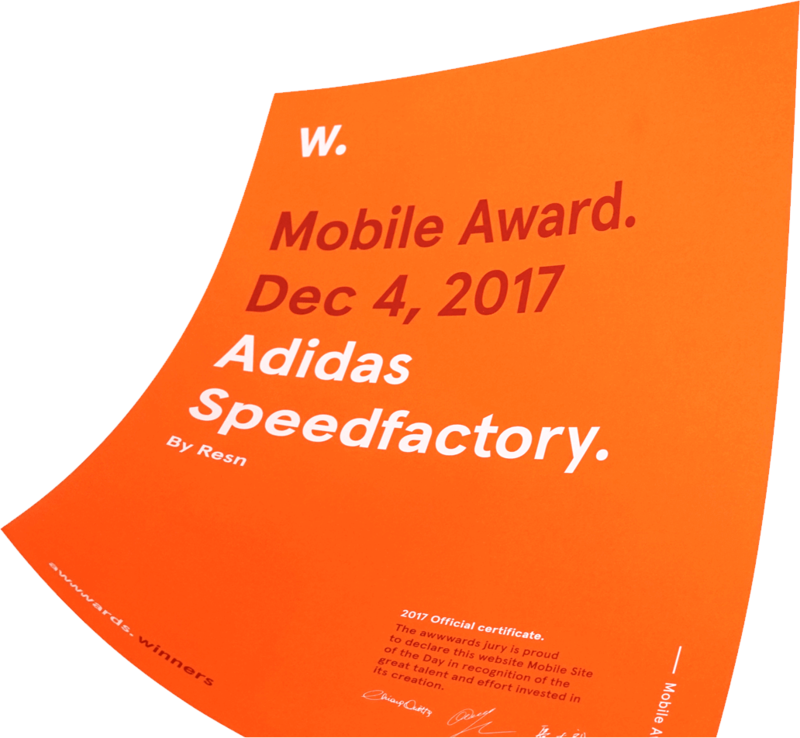 Mobile Site of the Year award will be given out at the Awwwards Conference Amsterdam 2019. Twenty websites with the highest score and an Honorable Mention will be nominated for this award and the Awwwards Jury will vote for the best.